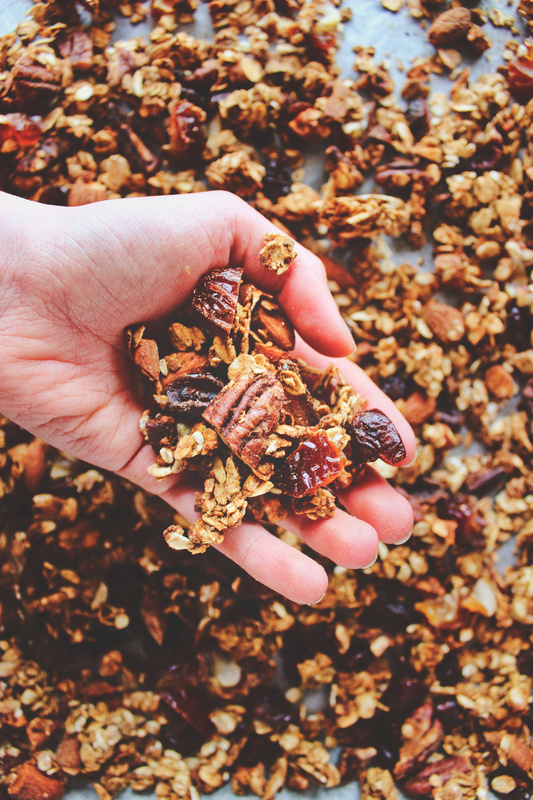 This spiced pumpkin granola will make you feel like it’s Christmas all year around. 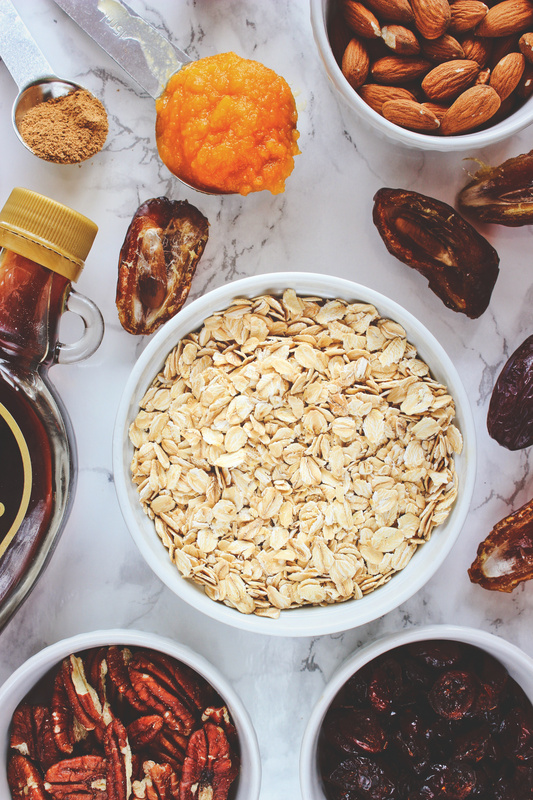 With crunchy clusters of oats, pecan nuts, and almonds flavoured with pumpkin purée, maple syrup, and the richness of blackstrap molasses and bursts of sweetness from dried cranberries and dates, this granola recipe is the perfect comforting winter breakfast. And did I mention it’s gluten-, refined sugar-, and oil-free, too? I’m obsessed with homemade granola. I never used to be a cereal or granola person, but it is one of those things that I, among many others, discovered after going vegan. 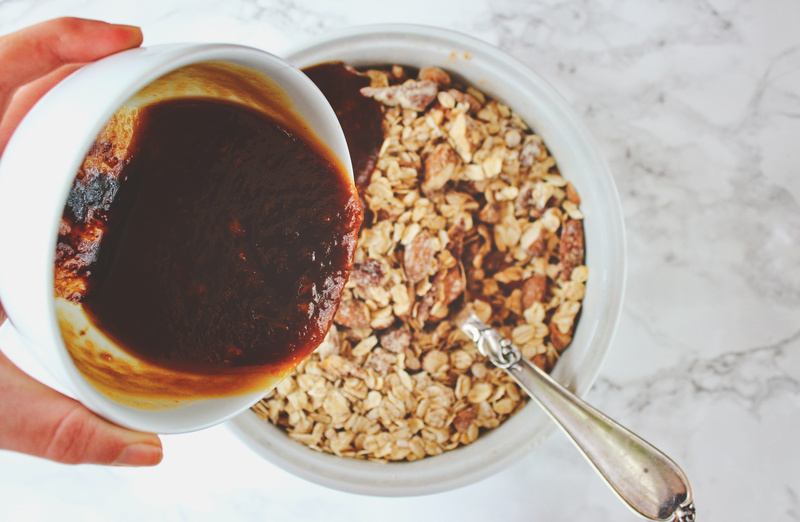 And because store-bought granola often contains a lot of added crap, such as refined sugar, oil, and other nasties, I quickly made it my mission to learn how to make granola at home. I don’t include a lot of oil in my diet, and I have found that you can often eliminate or at least reduce the amount of it in many recipes by substituting it for something else. 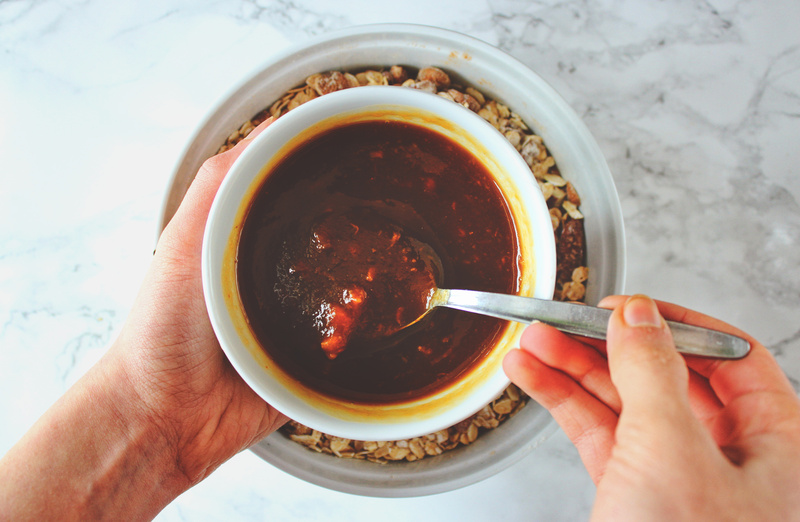 When making granola at home, I like to use nut butter, syrup, mashed banana, applesauce, or pumpkin purée instead, and it works just as well. 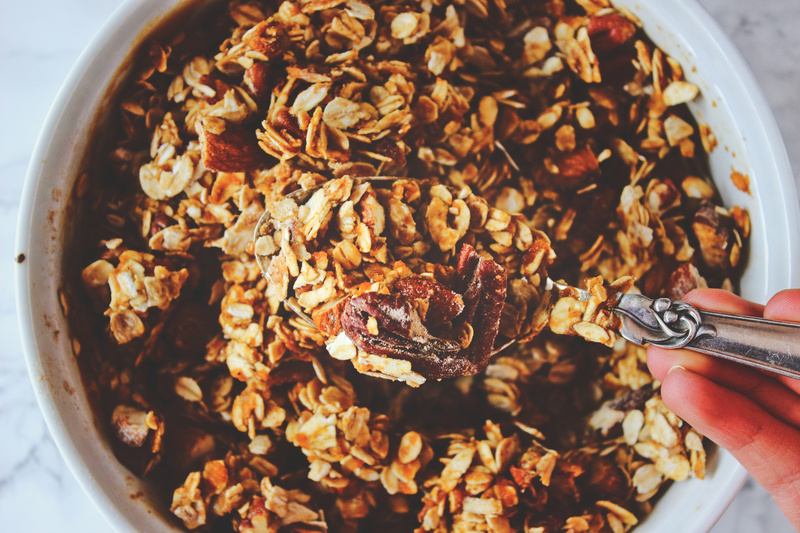 You don’t need oil to make delicious crunchy granola! 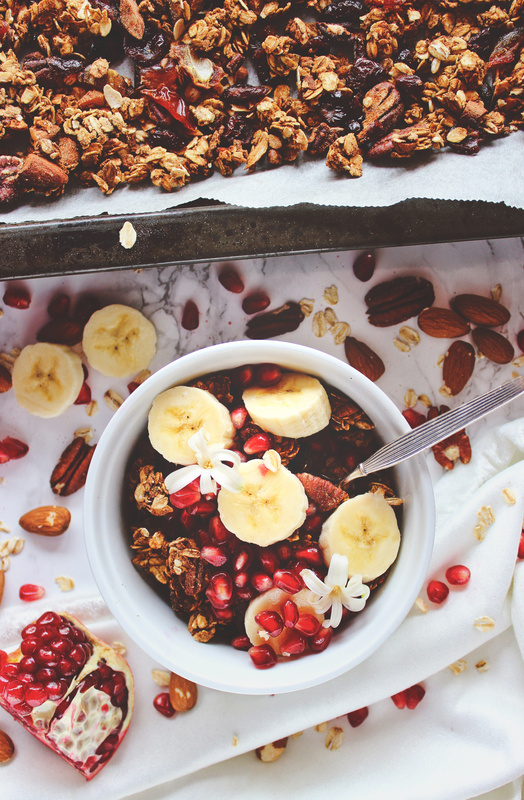 This granola recipe is my new favourite. It’s so sweet and spiced and cinnamon-y. Pecan nuts might actually be my favourite nuts (except for lightly salted macadamia nuts from a market in Spain – they’re better than heaven), and nothing beats my sweet friends, medjoul dates. It just has all the good ingredients, you know? spiced with cinnamon, and CINNAMON IS GOD! Pecan nuts and almonds: You can obviously use whatever nuts you’d like. I would recommend walnuts and hazelnuts if you want to try something different. Brown rice flour: I use flour in this granola because I find that it helps to bind it all together and get some nice, crunchy granola clusters, but you can leave it out if you don’t have it. Pumpkin pie spice: I know a lot of Americans use pumpkin pie spice in their recipes, especially during autumn, but it might be harder to find in Danish grocery stores. I usually make my own. It’s really easy, click here for a simple recipe. Pumpkin purée: Again, another American favourite which I have never spotted in a Danish grocery store. Fortunately, this is also very easy to make at home! I will write a note about how I make pumpkin purée in the recipe! 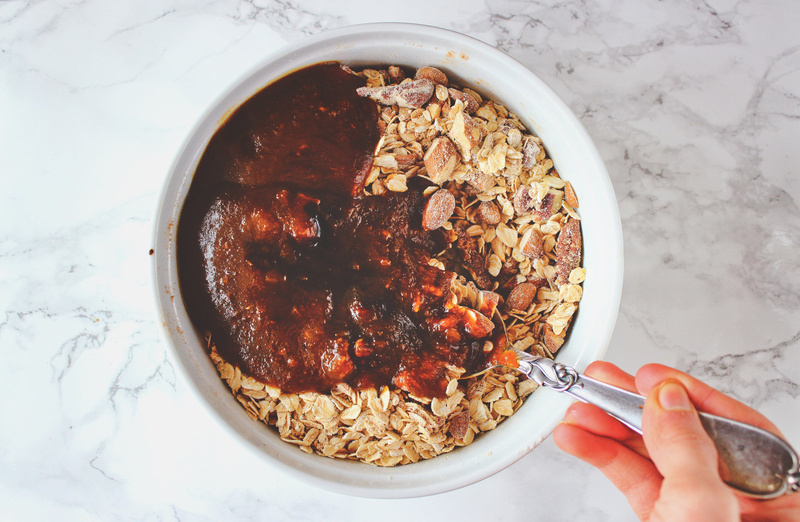 Blackstrap molasses: The true reason why I added this is because I have a jar of blackstrap molasses in the fridge that I have no idea what to do with. It tastes awful on its own, but mixed into this granola with the maple syrup, it actually adds a nice depth of flavour. You can leave it out, though, if you don’t have it. 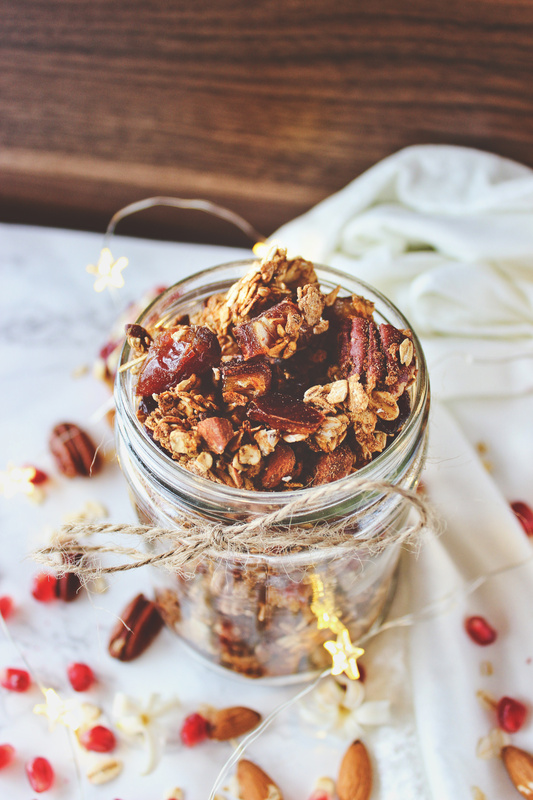 Dried cranberries and dates: These are optional as some people don’t like dried fruits (*cough* mum *cough*), but I recommend using them as they add to the natural sweetness and Christmas vibe of this granola. Step 1: Mix the dry ingredients together. Step 2: Mix the wet ingredients together. Step 3: Mix the wet and dry ingredients together. Step 4: Spread the granola out on a baking tray lined with parchment paper and bake it for 20 minutes, stir the dried fruits into it, and bake it for another 7-10 minutes. Step 5: Let the granola cool for a few minutes before serving it and completely before storing it! Don’t stir granola too often. The secret to granola clusters is to press the granola into one big layer and only actually stir it once or not at all during the cooking time. Let granola cool before breaking it up, serving it, and storing it. As it cools, it will become even crunchier, and you can break it into clusters. Store granola in a sealable jar or airtight container in a dry, dark place at room temperature. I keep mine in one of my beloved jars, but you will need a big one to fit it all in. 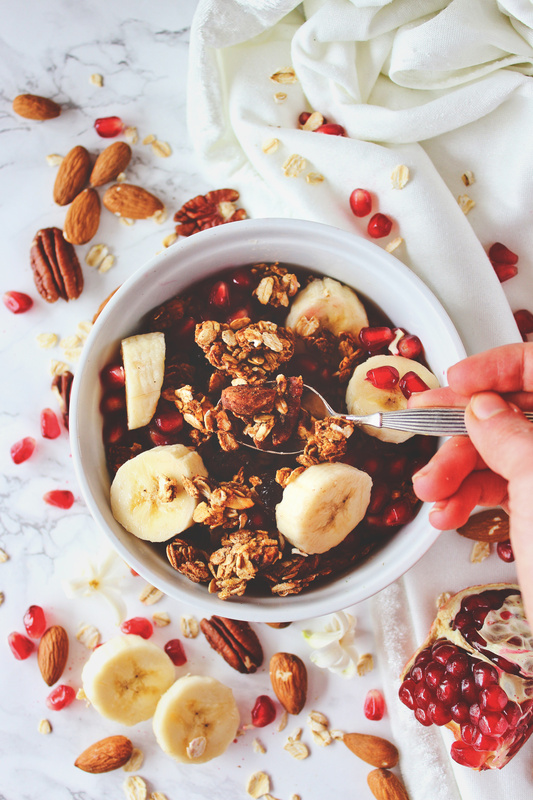 Granola keeps for a long time, so you can make a big batch and just use it throughout the month in your breakfasts or as a snack. And once you run out, you can make another batch. 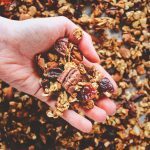 Homemade granola really isn’t time-consuming or complicated to make, and it is so much better than store-bought! As of now, I only have one other granola recipe on my blog – but it’s definitely worth checking out. I actually really like it, and now that I think about it… I haven’t made it in ages. Well, we all know what I’m going to do once I run out of my spiced pumpkin granola. If you decide to try this recipe, please, let me know what you think about it by leaving a comment below or taking a picture of your creation and posting it and tagging me on Instagram at @spirendeveganer. I would love to hear your thoughts and see your recreation. Take care until we meet again! Preheat your oven to 150°C, fan setting, and line a baking tray with parchment paper. 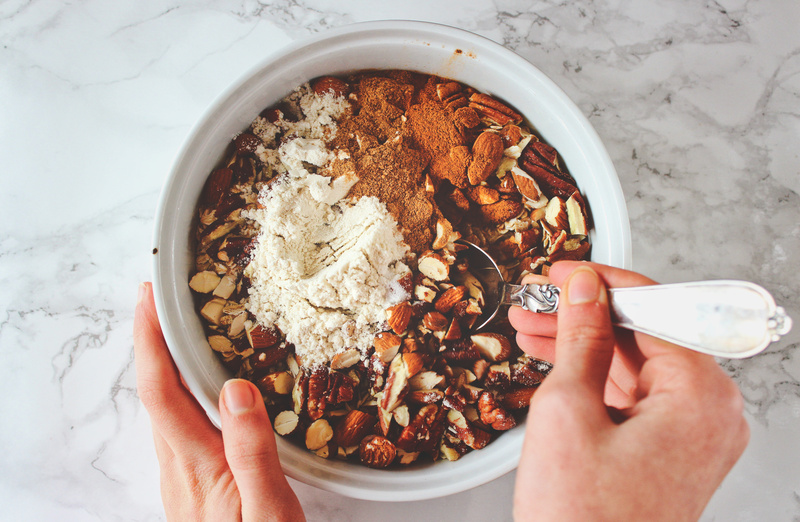 In a large bowl, mix the oats, almonds, pecan nuts, brown rice flour, cinnamon, pumpkin pie spice, and salt together. In a separate small bowl, combine the pumpkin purée, maple syrup, and blackstrap molasses with a spoon. Pour the wet ingredients over the dry and mix them well until all the oats and nuts are coated. Spread the granola on the prepared baking tray and bake it in the oven for 20 minutes without stirring. After 20 minutes, take the granola out of oven and stir the dates and dried cranberries into it. Place the granola back into the oven to bake for another 7-10 minutes until golden-brown and crispy, keeping an eye on it to make sure it doesn't burn. 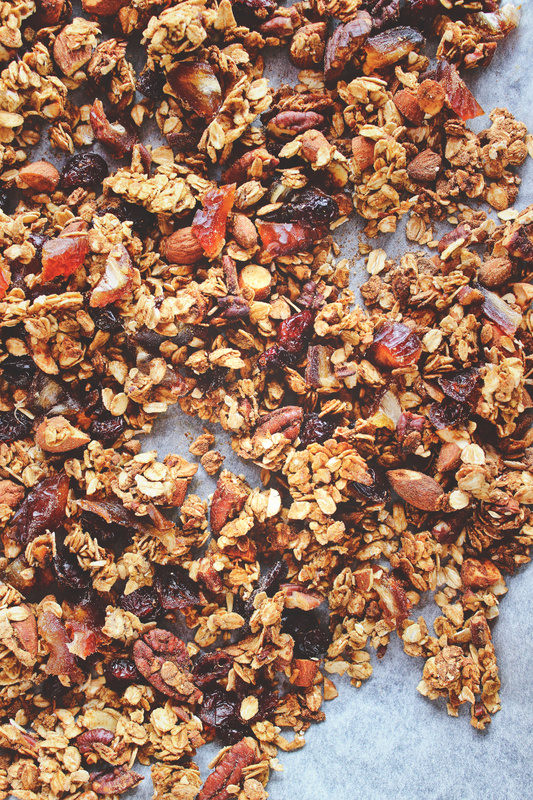 Remove the granola from the oven and let it cool for at least 5 minutes before serving. 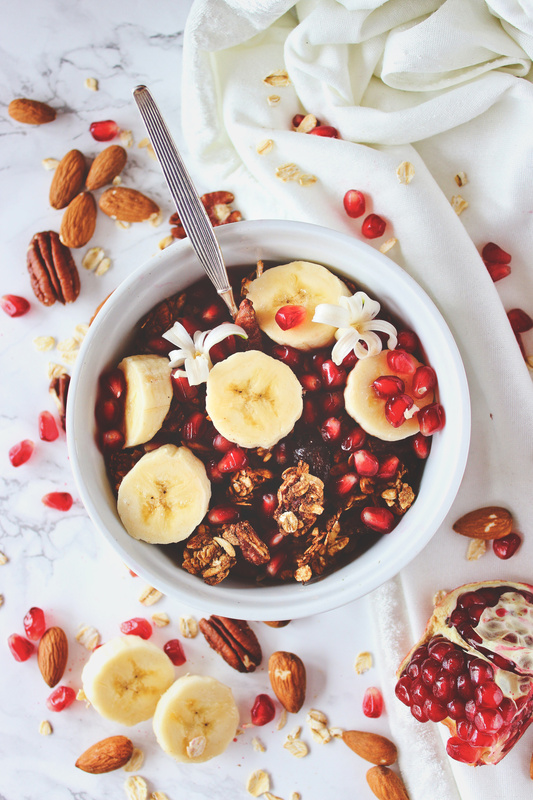 You can serve it as it is with fresh fruits and non-dairy milk or yoghourt, use it as a topping for smoothie bowls, or any other way you'd like! 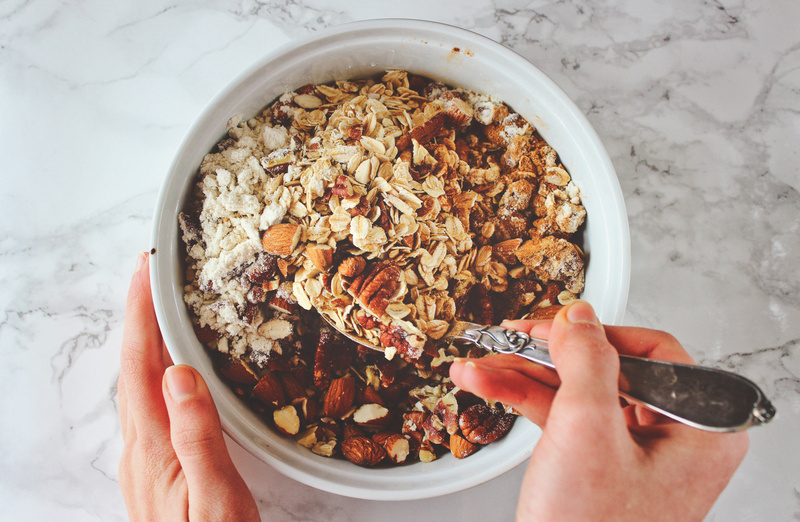 Let the granola cool completely before storing it in a sealable jar or airtight container in a dry place at room temperature for up to 1 month. You can use either homemade or store-bought pumpkin purée. It's actually very easy to make it yourself. I use butternut squash to make it, and I know butternut squash isn't a pumpkin, but a pumpkin is a squash, and they aren't much different from each other. To make pumpkin purée, I cut a butternut squash in half and roast it in an oven preheated to 200C for about 45 minutes until tender. Then I take the skin of it and blend the flesh of the butternut squash in a food processor until smooth, adding water to help the process. This makes more than enough pumpkin purée for this recipe. You can use leftover pumpkin purée in oatmeal, smoothies, veggie patties, as a base for soups and stews, and much more!